WOLF sinks its teeth into the history, science and myth of this remarkable creature, while putting a domestic finger on the pulse of our uneasy relationship with the wild. WOLF is the latest installment in Deke Weaver’s life-long project, The Unreliable Bestiary, and part of the Moon Festival this semester at the University of Illinois. The project aims to build a bestiary of performance-art pieces to consider through the lens of individual animals our evolving relationship with the natural world. Bestiaries are a medieval print tradition: they were detailed treatises on real and mythical animals, often exquisitely detailed, the catalog of which developed a moral argument for its readers. They were especially popular from the twelfth through the sixteenth centuries. (One of the most famous, the Aberdeen Bestiary, has been digitized and is now available online.) Just as this medieval tradition aimed to make claims about the ways in which the nature world can help orient ones moral compass, Weaver’s production of WOLF aimed to interrogate the dualistic role of this animal in our cultural imaginary as both a symbol of apocalyptic destruction and cosmic salvation. Like learning a language, performance art is best experienced through immersion. With token in hand, participants loaded up two buses outfitted with park rangers. (Getting a spot, however, meant literally camping out in line for more than two hours.) I was fortunate enough to be on the director’s bus and was led through the performance by the hand of its creator from start to finish. The bus ride was entirely guided. Audience members were provided contextual information and taken through several activities in preparation for our entrance into the “Allerton International Biozone,” protected home of the mysterious “star wolves.” The bus elements were of a variety of media, including: a verbal science background, a group sing-along to “Home on the Range,”some howling practice, a carnivore expert video, guided practice of wolf expressions, interviews with threatened farmers, and a ranger rendition of the catch-&-release lullaby. 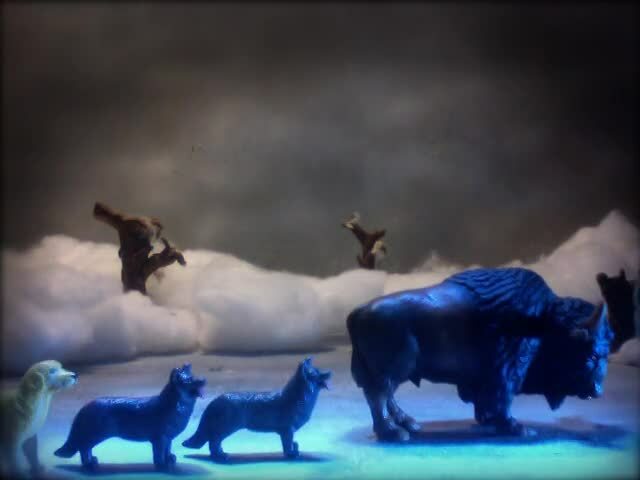 The mixedness of the environmental design (Grant Bowen) of this “first act” worked to demonstrate the complexity of the wolf’s current political position while feathering in questionable assertions—such as mystical star wolves from another planet making their home in central Illinois—to switch on the audience’s interrogatory suspicions. Equipped with the intellectual stakes wolves present, the audience was again divided into herds to make the trek through Allerton. For this “second act,” my “bison herd” separated at a fork in the path from our fellows in the “moose herd,” allowing for each of the four groups to have a unique experience. We experienced two wolf encounters along the path, one of a single trapped wolf and another of a path running alongside us. Signposts negated their own primary function by indicating the presence of wolves, bears, and star wolves essentially everywhere. From departure to return the audience’s attention was directed for every second not to any particular element, but to all the possible elements in our environs explicitly outside ourselves. Inside the Allerton Barn before its repurposing as the Allerton International Biozone ranger headquarters. The environmental design was the centerpiece of the production. All three acts of our movement through the evening—on the bus, walking through the park, and in the barn—was orchestrated and crafted to at least some extent. For the “third act” in this production we broke upon a clearing with the “ranger headquarters” and Barn interior performance space. The production was committed to the immersion approach even to the point of resisting allowing the participants affective responses that would gratify the performers but break the fiction of the Allerton International Biozone. This was most evident in the case of applause. The transition from topographical act to act was seamless. Even in our leaving we were asked to stand and hold hands in order to exit the barn to a serene soundscape. Before loading the buses we passed a woodsman chopping a huge pile of wood, reinforcing the fact that our environmental destruction is still on-going—that our attendance was not enough of an act of amelioration, but the threat continued. 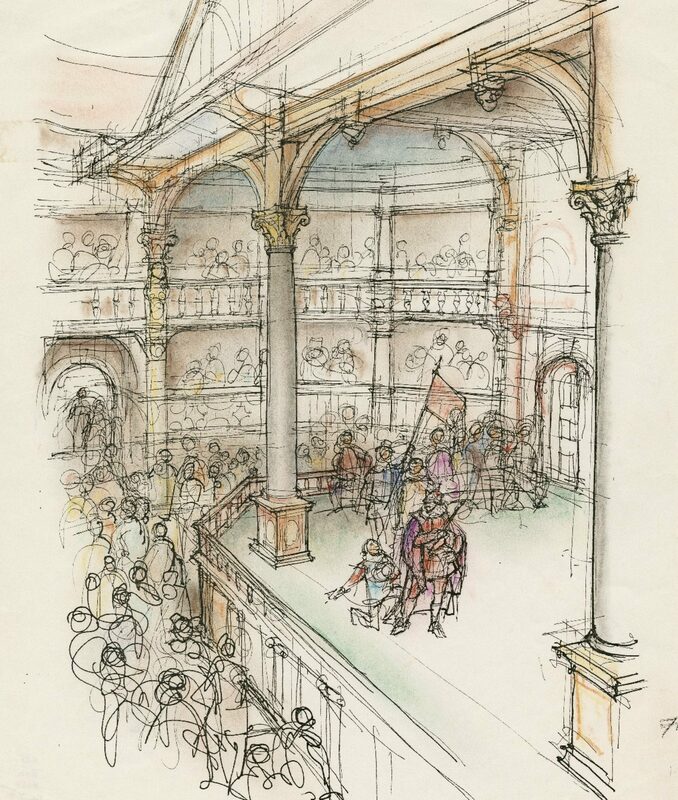 Furthermore, Weaver’s cultivation of immersion not only resisted allowing our usual habits of theatre attendance—which here would have acted as rituals of safety, familiarity—was the emphasis on silence and contemplation in one’s environs. I would argue that such a stance was more productive than the more usual trick of engendering discussion and engagement with fellow attendees during the course of or apart of a performance. For example, one sign along our twilight hike indicated that for the rest of the evening our guides would no longer be guiding us, but we were to make of our encounters what we would. Because of twilight’s fading light the performers were able to construct a sense of tension: were we going to actually going to encounter wolves? Were these trained wolves or actors? Jennifer Allen (choreography, codirector, performer), rather than direct mimicry, pinpointed the indicative exaggerations of wolves, especially in faces and timing. Seeing a trapped wolf far ahead on the path, it was unclear whether this was actor or animal.Suspending our disbelief for nearly half the journey, this trick put into relief our own animalistic and destructive tendencies toward the wild in blurring the distinction between actor and animal. 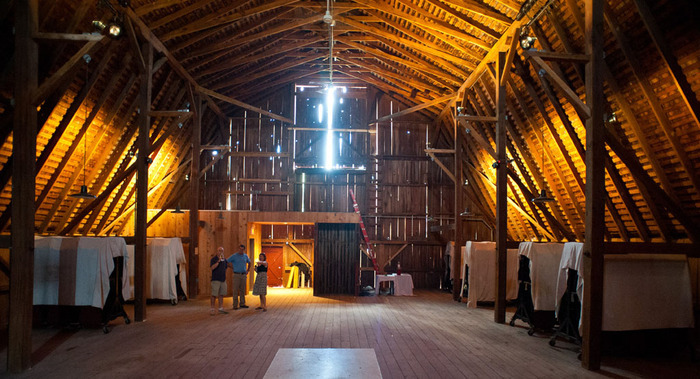 Once in the Barn, audience members were arranged in a theatre-in-the-round formation using tree stumps as seats. The mise-en-place of the Barn was reminiscent of something between a communal sweat lodge and a ramshackle national park ranger headquarters. Decorated with madonna-esque wolf posters and golden wolf statue, the headquarters suggested our cultural deification of the wolf as the harbinger of cheap mystical salvation. This was all the most heightened by the stark juxtaposition to the dilapidated surroundings common to a childhood visiting federal conservation parks, perhaps underscoring our own naive consumption habits regarding finite resources. Weaver seemed to argue that wolves have become emblems of both deep ecology and cheap mysticism. This “third act” contained the more formal (or at least expected) elements of the performance, crafting a vision of the wolf with a broad smattering of multi-media. Approaching the barn in the full dark, the wolf actors convened in the main meadow and performed pack choreography beneath the moonlight and a single pool of light emanating from a spotlight in the only tree in the meadow. This included dance, short stories, video art, sculpted spaces, live and pre-recorded spoken word and singing, each genre rarely in operation without another. These elements kept the articulation of wolf movement at the center, underscoring their status as cultural symbols of exile. In the spoken word elements their were frequent references to holocaust and genocide which rung with especial heft considering the escalation in Syria this past week. For Weaver, the politics of wolves seems to be that of paradox: at once signs of potential to save the environment as they are emblems of our own choices furthering ecological destruction. In light of their recent removal from the Endangered Species List and renewal of communal wolf hunts, how can we look to wolves to save us if we have in fact been the main and continued source of their destruction? To propose an answer, the mixed media, environs, and messages used to interrogate the place of wolves in our cultural imaginary relied on balancing the real and the myth. There were three narrative through-lines to the evening: the reality of the wolf population struggles on Isle Royale, a beer summit of corporate horror between Snow White’s Woodsman and Big (a.k.a. the Big Bad Wolf), and the ancient Native American myth of Fenris, the wolf at the heart of the world. The balance tactic used the absorbing power of myths to shock our systems into recognizing the reality to which they were analogues. By doing so Weaver was able to craft two arguments. First, wolves are indeed the heart of the world in that they present the most immediate symptoms by which we can diagnose the heath of our global ecology. The repopulation of wolves across the globe by the explicit influence and intent of humans was a step in the right direction; removing the wolves from a broad policy of national protection leaves them to the (usually destructive) whims of individual communities. Second, by writing new myths, some perhaps cobbled and some from whole cloth, we can begin to orient our destructive industrial relationship to the environment. Even in a corn desert like Illinois, wolves present a deep ecological approach to nature as not just a global but also a local—communally, individually—concern. Tickets are free and can be picked up outside the Krannert Center for the Performing Arts starting at 5:30pm from September 12-16. They were going fast so make sure to arrive early; first comers arrived at 3:00pm. Buses depart for the Allerton International Biozone at 6:15pm sharp. Weaver will be presenting excerpts from MONKEY, ELEPHANT, and WOLF at the 2013 Chicago Humanities Festival. This one-night-only event will be splitting the bill with Holly Hughes at the Lookingglass Theatre Company in downtown Chicago on 4 November beginning at 7:30pm. For more information on Deke Weaver’s life-long project, The Unreliable Bestiary, of which this project is apart, just him out on twitter or his blog, UnreliableBestiary.org. Want to know about Deke’s design vision? Check out the TEDTalk he gave (see the video below).